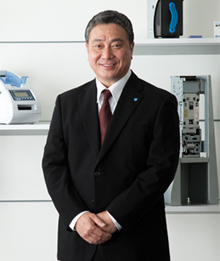 Greeting|Company Information|Japan Cash Machine Co., Ltd. Since its establishment in 1955, we have been developing, manufacturing and selling money handling products. With operations around the globe, including the USA and Germany, we strive to optimize reduction in cost of currency processing, while providing consumers an automated means of purchasing goods and services for a wide range of industries including gaming, banking, retail and transportation. We have a proven record of creating and deploying leading, secure transaction technologies that detect and defeat counterfeit attempts, while delivering seamless consumer purchasing. These technologies allow merchants and consumers to utilize those automated transaction opportunities with the highest confidence. You can rest assured that JCM Group, with a strong social mission, constantly satisfy and win the trust of our customers and users all over the world.